I remember a time when Widmer was only available as a tap selection at finer pubs in the Pacific Northwest. (Insert back in my day comment here.) Now after several years of expansions and creating a solid base it allows them the luxury to experiment with different styles. This is evident in the newest 924 series release of an Oatmeal Porter to the line up. I had the privilege to test drive the latest release this week at Irving Street Kitchen at a hosted media event from Widmer. The porter wasn't quite what I expected. Instead of being rich and creamy, it was crisp and sweet. Still a pleasant and solid beer from the brothers. It's already making appearances at bottle shops around town. Certainly try it while you can, it is a limited release! Special thanks to Widmer for hosting an excellent event, and inviting the #pdxbeergeeks to be part of it. Now the official release notes. 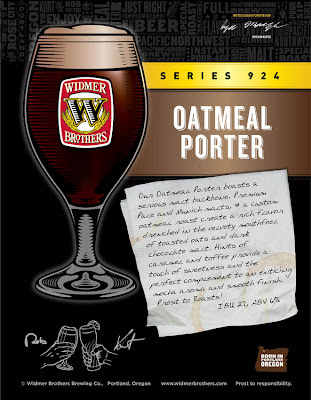 From Press Release - PORTLAND, Ore. – Feb. 28, 2012 – Widmer Brothers Brewing is expanding its Series 924 with the introduction of Oatmeal Porter, the first of three limited-release Series 924 beers that will be unveiled in 2012. Joining the two year-round Series 924 offerings, Pitch Black IPA and Nelson Imperial IPA, this rich porter was brewed with custom-toasted oats made specifically for Widmer Brothers by Briess Malting of Chilton, Wis. The oats, which have appropriately been dubbed “Bro-Oats,” contribute to the beer’s velvety mouth feel and distinct nutty flavors. Hints of caramel and toffee give this brew a touch of sweetness, complemented by mocha aromas and a smooth finish. 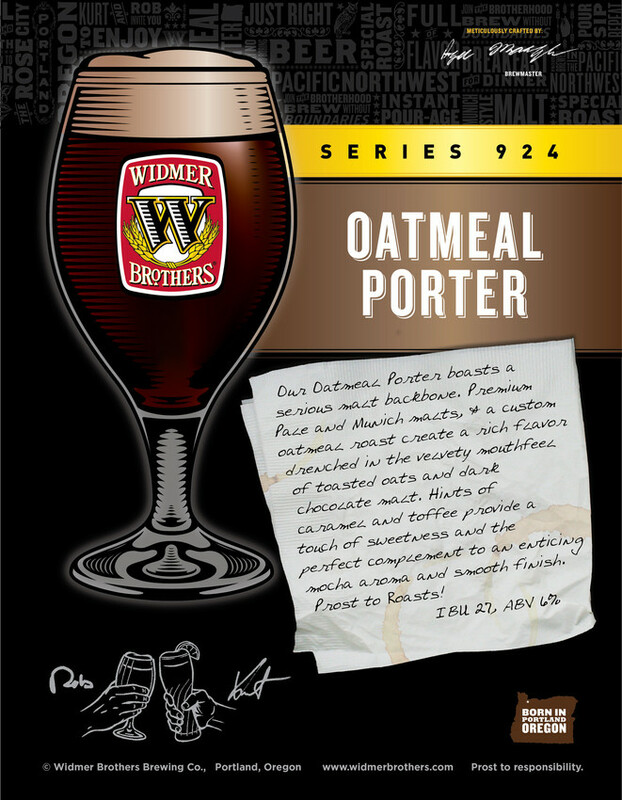 Oatmeal Porter is now available in four-packs of 12-ounce bottles, in 22-ounce bottles and on draught nationwide.